Location of Axis in Mobile County, Alabama. As of the 2010 census, Axis had a population of 757. The racial and ethnic makeup of the population was 66.8% white, 26.9% black or African American, 3.2% Native American, 0.1% Asian, 0.1% Pacific Islander, 0.1% from some other race, 2.6% from two or more races and 0.9% Hispanic or Latino from any race. Axis is located at 30°55′48″N 88°01′38″W﻿ / ﻿30.92990°N 88.02722°W﻿ / 30.92990; -88.02722Coordinates: 30°55′48″N 88°01′38″W﻿ / ﻿30.92990°N 88.02722°W﻿ / 30.92990; -88.02722 and has an elevation of 39 feet (12 m). Mobile County Public School System operates public schools. Students are zoned to North Mobile County K-8 School, previously North Mobile County Middle School; and Citronelle High School in Citronelle. On September 7, 2010 North Mobile County Middle School opened, replacing the role of Adams Middle School in Saraland, because residents outside of Saraland are no longer zoned to Adams Middle. North Mobile County middle had been built on a "16th section", a piece of land allotted to each school district under an Alabama law stating that for each sixteen portions of land in a county, the school district will take one portion of land. Some City of Satsuma residents disliked North Mobile County Middle's distance and remoteness from Satsuma, prompting them to call for a separate school district. The Mobile County government built the school outside of the Satsuma city limits so the city government would be unable to possess the school if it opted to secede. Prior to the split of Satsuma from the Mobile County system, Axis was zoned to Satsuma High School. In 2011 Renee Busbee of the Mobile Press-Register said that residents of Axis may be rezoned to Blount, Citronelle, and/or Vigor high schools. ^ "Properties on the Alabama Register of Landmarks & Heritage". Alabama Historical Commission. www.preserveala.org. 4 June 2009. Retrieved 21 July 2009. 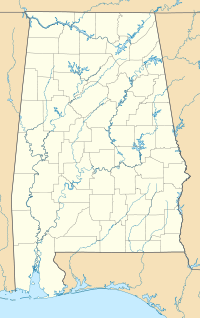 ^ "2010 CENSUS - CENSUS BLOCK MAP: Axis CDP, AL." U.S. Census Bureau. Retrieved on November 27, 2018. ^ "North Mobile Middle Attendance Zone." Mobile County Public School System. Retrieved on November 27, 2018. ^ "Welcome to North Mobile County Middle School." North Mobile County Middle School. Retrieved on October 22, 2010. "The North Mobile County Middle School serves students living outside the Saraland City Limits and includes students from Satsuma, Creola, Axis, and Prichard. We will be located at the current Lee Intermediate Building and will be located here until a new facility is completed on Salco Road." ^ "Citronelle High School Attendance Zone." Mobile County Public School System. Retrieved on November 27, 2018. ^ Philips, Rena Havner. "Satsuma sets tuition for out-of-city students at $650." AL.com. April 29, 2012. Retrieved on July 29, 2016. "Officials in Satsuma, which is forming its own school system in August, are hoping to attract residents of Creola and Axis." and "The Mobile County school district is converting North Mobile County Middle on Salco Road in Axis into a kindergarten through eighth-grade campus. But students in that area who now attend Satsuma High School are being officially zoned to Citronelle High School, 20 miles away." ^ Phillips, Rena Havner. "Video: North Mobile County Middle School opens its doors in Axis." Mobile Press-Register. Tuesday September 7, 2010. Retrieved on October 22, 2010. "North Mobile County Middle School students 6th grader Derrick Boykin, 12, and 7th grader Amanda Daniels, 12, walk down a sidewalk on the first day of classes at the school Tuesday, Sept. 7, 2010. The newly completed $14 million school was built to accommodate students displaced by Saraland's split from the Mobile County system. " ^ Havner, Rena. "School distance key issue in proposed Satsuma split from Mobile public schools." AL.com. January 24, 2011. Retrieved on June 14, 2016. ^ Busbee, Renee. "Parents upset that children may not be able to attend Satsuma High School." Mobile Press-Register. Saturday May 21, 2011. Retrieved on November 17, 2012. This page was last edited on 24 January 2019, at 11:40 (UTC).